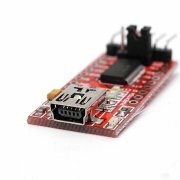 The board is for FTDI’s popular USB to UART IC. Now with internal oscillator and EEPROM, the FT232RL is an impressive IC! Expansion FT232RL IO for RS-232, bit-bang, or special function modes. POWER, RXD, TXD, LED status indicatiors.